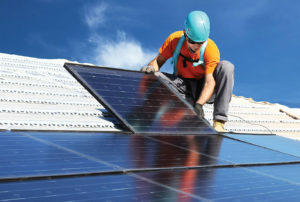 The South African Photovoltaic Industry Association (SAPVIA), in association with Deutsche Gesellschaft für Internationale Zusammenarbeit (GIZ), BSW Solar, GreenCape, SARETEC and DGS Berlin, has developed a programme to ensure that solar photovoltaic (PV) installations are done responsibly and sustainably. It is estimated that close to 60 000 solar PV installations have been undertaken in the residential, commercial and industrial (RCI) market segments in recent years. The unofficial installed capacity of rooftop solar PV installations amounts to more than 300 MW, while installations amounting to only 38 MW have been officially registered with the appropriate municipalities. The small-scale embedded generation revolution is already underway and as the industry body SAPVIA sees itself as having a crucial role to play in ensuring that installations are of a high quality and comply with municipal and national electrical regulations. Called the PV green card, the programme focuses on education, skills development and training to build installer capacity as well as improve standards development and compliance in line with international best practice. The PV green card contains details of the installation including details of the PV modules and inverters which were used, as well a checklist of all of the necessary installation steps which were completed. The installer is able to use the PV green card to declare compliance with relevant standards as well as safety guidelines for the installation. This will provide investor confidence, commitment from participating industry players and empowerment of the solar PV system owner. It is therefore recommended that a PV green card should be issued with every small-scale solar PV installation by suitable qualified installers. The post Programme to ensure high quality PV installations launched appeared first on EE Publishers.